When I go to bed on Sunday night, everything is ready for the coming week. The schedule is full. The menu board is full. The dishwasher is full. The laundry basket is full. The refrigerator is full. The in-box is full. The lunch box is full. The to-do list is full. 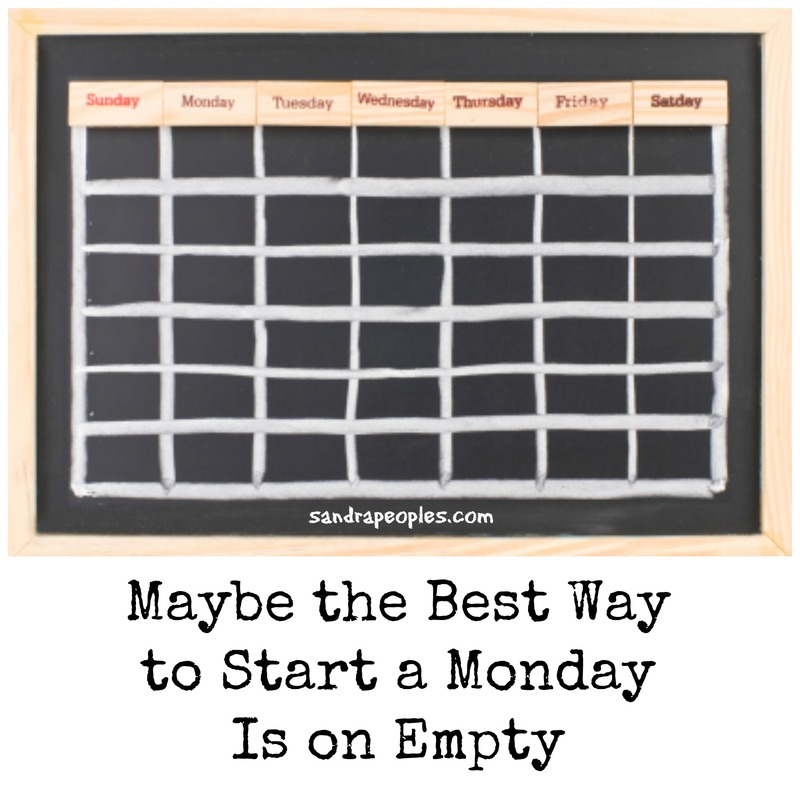 But maybe the best way to start a Monday is on empty. Nothing on my schedule. Nothing in my in-box. Nothing on my to-do list. Not even cooking, laundry, or dishwashing. Nothing apart from Him. I want to do it all in my power. Seems faster and easier that way. Not to have to stop and pray. Not to ask and submit. Not to always exhibit love, joy, peace, patience, kindness, goodness, faithfulness, gentleness, and self-control. But just “git ‘er done.” Isn’t that what Mondays are all about? Knowing we can do nothing is binding and freeing at the same time. Binding myself to God at work. Freeing myself from all the me and my that get in the way Monday and every day. Do you need to empty yourself this morning? Abide in Him instead? Lay it down at His feet. Submit it all to Him. Ask Him to work through you. Thank Him for His sanctification and grace. Then open your eyes and see all your fullness as it truly is—empty. This is exactly what I needed to read last night … and again this morning. Thank you! Thank you. It was very timely for me to come across your blog, and to read this post. We just got home from two weeks away, and it is easy to just automatically shift into a “to do” list mode. I am desiring to grow in the daily surrendering of my time (and my tasks) to Him (something I am continually asking for His help with). Your post was an inspiration to me. Best piece of advice I have seen in a long time. Start Monday on empty. wonderful!